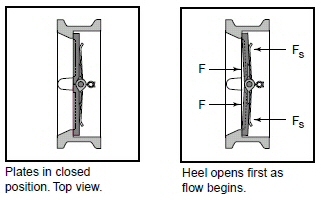 Unique hinge design reduces friction forces by 66%, which improves valve response significantly. Support sleeves are inserted through the outboard hinges so that the upper hinge is independently supported by the lower sleeve during valve operation. This allows both plates to close at the same time for quick response, and excellent dynamic performance. 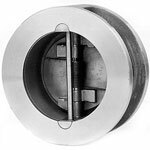 Lightweight and Compact Wafer Design – Installs between mating flanges with 10 to 20% the weight of flanged swing checks in popular sizes – Saves money in initial valve cost and provides lower installation cost. 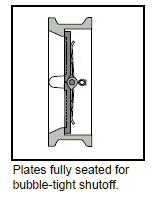 Dual Plate, Flat Seat Design – Plate heel is lifted first by design to prevent seat wear. Employs two spring-Ioaded plates with flat seats – Gives superior performance and tight shutoff to meet industry standards. 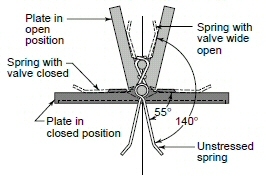 Independent Spring Action – Maximum deflection of 140°, provides improved valve response and longer life – Saves money with longer valve life and improved system performance by reducing water hammer. 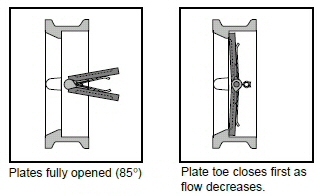 Independent Plate Suspension with Unique Hinge Design (larger sizes) – Improves valve response and reduces friction forces by 66% – Further assurances of non-slam performance with faster valve response. 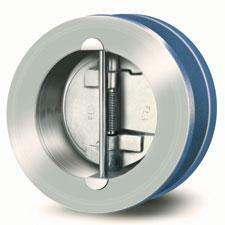 Simple, External Body Geometry – Configuration simplifies valve insulation – Saves money. Variety of Body Designs Available (Lug and Double Flange) – Provides options to suit application needs – Eases your selection process by utilizing the industry leader as your single source. Wide Variety of Materials – Versatility for many services – Satisfies more application needs. Flexibility in Installation Position – Provides more rigidity than pipe, eliminating concerns of pipe bending loads of flanged valves – Safety against thermal or seismic catastrophes. Body Strength and Rigidity – Some sizes suitable for horizontal or vertical up positions – Simplifies piping design, eliminates constraints that swing checks create. Retainerless Duo-Chek® Design Eliminates Body – For critical service applications, prevents possible escape of unwanted and/or hazardous materials to atmosphere – provides safety in critical services by eliminating environmental concerns. Standards in Lug and Double Flange Designs. 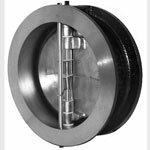 Vertical Hinged Design – In horizontal position flow allows plates to function freely and full open under lower flow conditions as compared to swing check – Reduces pressure loss, improves dynamic response and eliminates valve chatter. Special Valves Meet Market Needs – Wide size range, pressure range and added options allow further market needs to be met – Reliance on world’s largest wafer check line to supply more needs.